Deconstruction is a process that will save you time and will facilitate your construction process. Understanding how the deconstruction process is will be vital for you to succeed and be competitive in today's market. Specialized companies are making lots of money by assisting contractors during their deconstruction process, but it will be better if you are familiarized with the terms and even better if you can do it by yourself. Now let's understand when is feasible to deconstruct, the terms and the cost associated with this process. The simplest of all processes and includes deconstruction or demolition of abandoned structures. It is cost effective and fast to complete but be aware that is only intended for deconstructing of relatively small structures. Be aware of your employees' safety at all times as this one requires contact with all small pieces being removed. This process normally is carried out by using hammers, crowbars, and handheld tools. Small equipment such as lifts, bobcats, and others can be used to transport the small pieces being removed to other areas. This process involves more logistics on a broader area generating even larger pieces that can be reused later on. This technique uses mechanical and power-actuated equipment to break pieces or separate building materials that are large and cannot be handled by hand. Telescopic equipment, cranes, lifts, and other tools are used assisting employees to separate building components and moving them into laydown yard areas or preparation facilities. For example, girders and joists can be removed from a ceiling so they can be installed over a new facility. 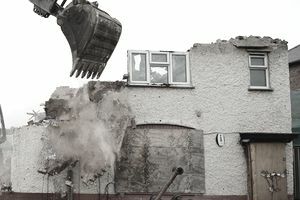 Deconstruct can be costly, and by costly we mean that you will probably spend at least twice the amount of money spent during a demolition process. However, it is important to understand that donations can be a good way to receive tax breaks that will potentially reduce your tax liability and will end up offsetting the cost of the construction. The work must be completed by a licensed contractor, so be sure to have your papers and registration up to date. Simply having a contractor’s license does not qualify a contractor to perform deconstruction. An appraisal is necessary if the value of the materials is $5,000 or more and shall not be more than 60 days before the donation date. There are IRS appraisers ready to do this work. Keep and maintain all your paperwork, donation letters and receipts of donated material in order to submit them to the IRS. While the amount of charitable donations that you may claim in a given year may be limited, unused charitable donations can be carried forward to future years for five years. The materials valued by the appraiser shall be part of a list with detailed information in regards to its condition and type of material being donated. If the donated property is capital gain property, the organization shall have a mission to reuse this material, so be sure to choose a non-profit organization that does have a mission to reuse donated material. Otherwise, you might end up with a deduction limitation by the IRS. Thes numbers do not include permitting either the cost of hazardous material handling. However, these factors will affect the overall numbers. Also when the property is a multi-story building, or when it has a concrete driveway, sidewalks, plazas and/or asphalt, these costs might vary. These numbers also might change depending on the condition of the material being salvaged, distance from landfills and where the new material will be donated warehouses and tax bracket. Still, the numbers are always positive for a deconstruction process over a demolition procedure. Please do remember that some cities have included demolition taxes that shall be added to your total cost, so please revisit the option of deconstruction prior to starting the demolition process.